Chicory is a perennial plant that can grow up to 100 cm tall. Its flowers are usually bright blue, and occasionally white or pink. Chicory leaves grow from the base of the plant, forming a ring of foliage. The stem is quadrangular and its roots can be 8-10 cm long. Chicory belongs to the sunflower family and is a native of Europe and North America. The plant can be easily spotted growing wild along roads, in parks, gardens and across disturbed areas of urban land. 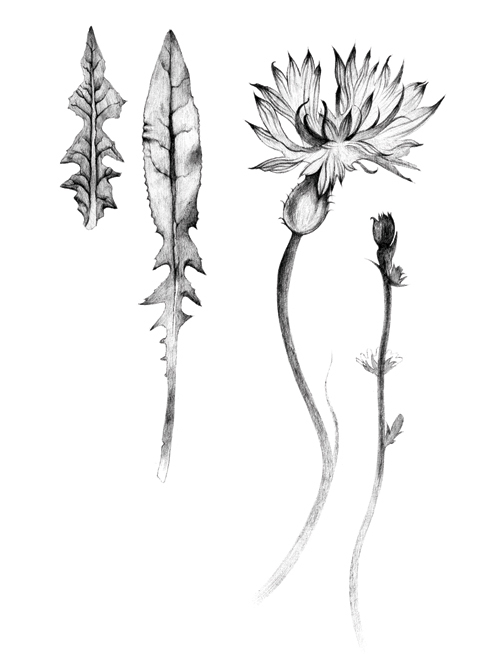 Chicory has been widely cultivated and extensively hybridized, therefore the leaves have broad shape variability. The plant has been recognised as food resource since historical time, Horace mentioned Chicory as one of the ingredient in his daily meal. Chevallier A. 1996 Encyclopedia of medicinal plants, D.K. Publishing Book, New York, 187. Roohi Zaman and Sadiya Noorul 2013 A Review Article of Beekhe Kasni (Cichorium intybus) its Traditional uses and Pharmacological Actions Research Journal of Pharmaceutical Sciences 2:1-4. Judžentienė and J. Būdienė, Volatile constituents from aerial parts and roots of Cichorium intybus L. (chicory) grown in Lithuania. Chemija 19: 25–28. Angelina Quintero Araceli, Pelcastre and Dolores Jose, 1999 Antitumoral of Pyrimidinederivatives of Phytochemical sesquiterpen lactones. J Pharm. Pharmaceut. Sci. 3:108-112. Hazra B., Sarkar R., Bhattacharyya S. and Roy P. 2002 Tumour inhibitory activity of chicory root extract against Ehrlich ascites carcinoma in mice. Fitoterapia 73:730-733. Tousch D., A.-D. Lajoix, E. Hosy et al. 2008 Chicoric acid, a new compound able to enhance insulin release and glucose uptake. Biochemical and Biophysical Research Communications. 377:131–135. I. Gürbüz, O. Üstün, E. Yeşilada, E. Sezik, and N. Akyürek. 2002 In vivo gastroprotective effects of five Turkish folk remedies against ethanol-induced lesions. J Ethnopharmacology, 83:241–244. Bischoff T.A., Nguyen-Dinh P., A.G., Arefi M. Laurantos C.J. Kelley and Y. Karchesy, 2004 Antimalarial activity of Lactucin and Lactucopicrin sesquiterpene lactones isolated from Cichorium intybus L. J. Ethnopharmacol, 95:455-457. P. N. Pushparaj, H. K. Low, J. Manikandan, B. K. H. Tan, and C. H. Tan, 2007 Anti-diabetic effects of Cichorium intybus in streptozotocin-induced diabetic rats J Ethnopharmacology. 111, 2:430–434. Chopra R.N., Nayar S.L. and Chopra I.C. 2002 The glossary of Indian medicinal plants, CSIR, New Delhi, 44. European Medicines Agency 2013 “Assessment report on Cichorium intybus L., radix,” EMA/HMPC/113041/2010.